Tourney Master 3 is an All-in-One tournament management software product. It unites ease of use with rich set of features needed to accomplish any task during the tournament. If you are intended to run a tournament, our software is the right choice. Tourney Master 3 supports five tournament systems. Create events for Single Elimination, Double Elimination, Pool Play, Round-Robin, and Consolation. Each tournament system has considerable quantity of parameters. For Single Elimination event you can plan games for 3rd and 4th places. For Double Elimination event you can indicate whether the loser's bracket champion must beat winner's bracket champion twice or not. For Round Robin and Pool Play events you can set number of pools, number of points each participant receive depending on match outcome, tie-breakers and their order. All events are divided into rounds. Set particular settings for each round: maximal number of games in each series of the round and the way the winner of series is determined. Tourney Master 3 supports three types of winner determination: by number of games won, by number of game points and by total games score. In the first case you can set "Best of X" series, for instance, "Best of 1", "Best of 3" etc. In the second case you can set how many game points each participant receives after each game, depending on game's outcome, the winner is the participant with most points. In these two cases the winner can be determined even if not all games have been played; the program will automatically determine the winner and mark all unnecessary games as "Cancelled". In the third case the winner of series is the participant with the most total score (e.g. with the most total goals), thus all games in series must be played. View and edit detailed description of every game: the score, game points each participant received, date, time, playing location, internet link to the game record etc. You can also add number of points each participant scored during each game division and overtime. Tourney Master 3 automatically generates optimal and conflictless schedule. Just add dates, times and location availability and the program will take care of the rest. If you have several locations available on the same dates you can setup schedule slots for all these locations with one click. You can setup when and how often each location is available (every day / week / weekend / workday / month). Tourney Master 3 handles rain dates and other delays. You can easily cancel and reschedule a game or reuse its time slot by another game. Furthermore you can create the schedule manually in semi-automatic mode. During the tournament you need to view, edit or delete game results and do it fast and correctly. 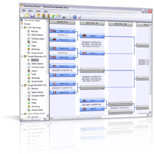 Tourney Master 3 provides three types of user interface for tournament management: the tournament bracket view, the series/games view and the schedule management view. You can use each one as the case may be. The tournament bracket view provides information about how participants are progressing in the event. In this section you can also replace participants, and do it even when the tournament is already running on. The series/games view provides information about games and series of games. You can sort and filter them by round, date/time, location etc. This section is useful when it is necessary to view and edit series and games which are about to begin, games of the specific round and so on. The schedule management view provides specific information: when and where games are to be played. In this section you can view and edit various time and location related information, sort and filter games by status, date, location as well as keep track of location usage. This section also provides means of manual scheduling; you can reschedule games, set their date, time and playing locations manually. Optionally enter seed numbers for participants and automatically seed brackets using Advantage, Random and Random by Groups seeding methods. You can also manually seed teams. Advantage seeding method places top seeded participants as far as possible from each other. Random seeding method fills the bracket randomly. Random by Groups method fills the bracket randomly, but participants from the same group are seeded as far as possible from each other - you can use this seeding method is you run a tournament amongst several clubs or cities, and you don't want participants to play against their teammates or neighbors in first rounds. Tourney Master 3 allows you to set the next event, where winners of the previous one will advance. You can also select the specific round which survivors will advance. Advancement parameters can be set for any event with any tournament system. So you can create various tournament stages, e.g. pool and play-off and more. Tourney Master 3 can create tournaments with unlimited number of events, participants and locations. Our software is powerful enough to handle huge tournaments with 1000-2000 and more participants. Using the well thought-out interface you can easily manage a competition of any size. Tourney Master 3 works for team and individual player tournaments, thus our software is great for any sport including baseball, basketball, volleyball, wrestling, tennis, soccer, hockey, martial arts, football, paintball and more. All tournament brackets, charts and reports you create during the tournament can be printed on the paper or exported to the Web-format (HTML). The program can print simple and wallboard size tournament brackets on the paper of any size. When you export a tournament bracket to the Web-format (HTML) the program optimizes it, so even a large bracket consumes much less disk space than it would. Select visual appearance for charts, brackets and reports you create with our software. Tourney Master 3 provides about a dozen of skins, so you can select the one you like. New skins can be created with the Skin Editor. Tourney Master 3 generates standings for each event. Standings are generated in real time and always up to date. Standings display information about participant's rank and can be generated even for elimination events. For pool play and round robin events standings display each participant's rank with all tie-breakers used. For elimination events standings display an approximate place each participant took - first three or more (for double elimination events) places are specified precisely, but for other participants their place is displayed as "Top X", e.g. "Top 8", "Top 16", "Top 32" etc. Save data from your tournament to XML files and import players, teams and locations to the next tournament you create with Tourney Master 3 or to any other software. Tourney Master 3 Professional is the standart version that fits most tournaments. After registration it has the following limitation: Maximal number of events per tournament is 3.